The Netherlands! A country full of bikes, cheese and magical landscapes with tulips and windmills. Dutch people always had a flair for international trade and business – they founded the Dutch East Indian Company (VOC) in 1602, the first (or one of the first) multinational corporation in the world. But not everything is about business! The Dutch also have a great fondness for ‘gezelligheid’, which translates into warm, cozy, friendly and fun social situations. Located in the Western part of Europe and sharing borders with Germany and Belgium, the country has 17 inhabitants and a population density of 414 people per km2, making it the fourth most densely populated country worldwide! With a strong international outlook, the country offers plenty of opportunities to international job seekers. 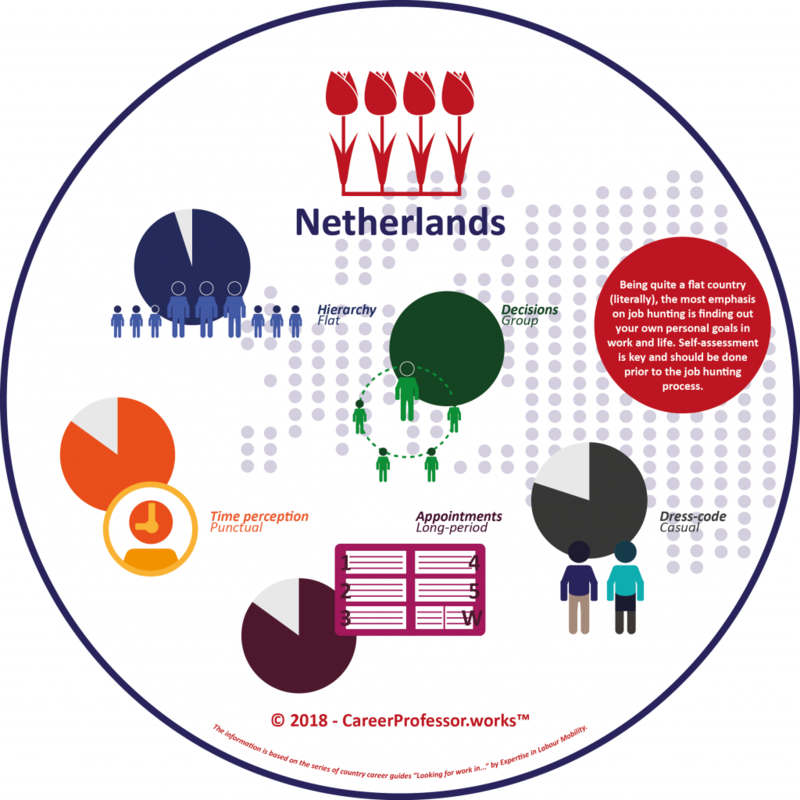 If you are thinking of working in the Netherlands, take a look at our CareerProfessor.works infographic below, which will help you prep for the challenges you will encounter in a Dutch working environment. Click here for a legend of the infographic. 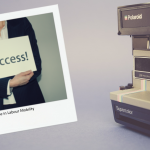 The equality and openness of the Dutch society are reflected in the business structure, where both the managing director and the employees are all considered co-workers. The ‘boss’ is usually considered part of the team, but don’t let this fool you since executives still have a higher degree of authority. Taking initiative and responsibility and working independently is common for Dutch employees. Taking the personal blame is not very common in a Dutch office, but in case of failure, the blame will be put on the ‘system’ or ‘the circumstances’ instead. The Dutch – in line with their longing for consensus – are fond of meetings. Meetings are usually informal, yet they are generally on fixed times, following certain protocols and set agendas. All members are expected to make a contribution during the meeting, regardless of their position in the company. Everyone is expected to be on time for the meeting; being late without prior notice will make you look unreliable and disrespectful. Most decisions, be it in politics, business and even in social life, are based on consensus. Everybody has to agree to a certain extent to a decision, and someone can always share his or her opinion on a subject. The main aim of meetings is to discuss the options, reach consensus and eventually make decisions. The process of reaching a conclusion is often time consuming. 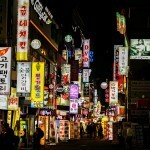 However, once a decision is made the implementation is fast and efficient. “Time is money” is a typical catchphrase in the Netherlands. At meetings, the Dutch prefer to get right down to business and skip the small talk as this is considered a waste of time. Planning a meeting a month ahead of time is quite common in Dutch business culture since profound planning is half the job in Dutch eyes. In general, the Dutch dress code is rather informal and the Dutch do not put great emphasis on clothing and prefer an unpretentious outfit rather than flamboyant fashion. In general, business suits are worn mostly by people in management positions, at meetings and at special occasions. For official occasions, men were suits and a tie and women wear dresses or suit pants. Did you know that the work culture in the Netherlands is very different from that in Sweden?